Huggable musical orbs? 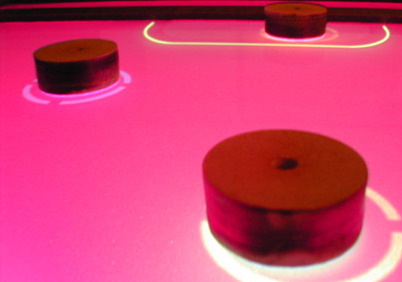 A tabletop music game in which you throw around virtual MIDI balls? Digital windchimes? Installations of giant ears, spheres, and a washing machine you stick your head into? The legendary Near Near Future’s Regine reports on orbs you can hug, virtual balls you can play with, washing machines you can stick your head in, and a keynote on why digital art in 2005 may be a lot like 1734. Personally, I like playing with balls, be they virtual balls or giant huggable orbs. So, what’s with all these interactive tables? See my previous report on tracking the use of tabletop interfaces. If this one looks familiar, there’s a reason: it’s based on the previous Interactive Surround Sound Cube. I like the idea of tabletop interfaces: maybe soon we can incorporate pool/ping-pong and cupholders, too, features my factory-standard Mac tower lacks.